CISF Notification is out. CISF is recruiting for 429 Head Constable Govt Job (Last Date Extended) Posts. You can check CISF - Central Industrial Security Force last date, download CISF notification, visit CISF official website and check other CISF Vacancy details.Complete Vacancy and recruitment Details about 429 Head Constable Govt Job (Last Date Extended) vacancies in CISF are provided below by JobSarkari.Com only for you. Last Date of Pay Exam Fee. 25/02/2019. SC/ ST/ Female. No Fee. Mode of Payment. Candidate Can Pay Application Fee Through Online Banking, Debit And Credit Card or SBI Challan. Direct Male. 167. 88. 49. 24. 328. Direct Female. 21. 09. 05. 02. 37. LDCE. 34. 17. 09. 04. 64. Total Vacancy. 222. 114. 63. 30. 429. Candidate Must Have Passed Class 12th From Any Recognized Board of India. Age Relaxation. 3 Years For OBC And 5 Years For SC/ ST As Mentioned in Notification. Height. 165 Cms. 162.5 Cms. 155 Cms. 150 Cms. Chest. 77-82 Cms. 76-81 Cms. NA. NA. 2. OMR/ Computer Based Written Examination. Q. What is the Last Date For CISF Head Constable Govt Job (Last Date Extended) Vacancy ? A. 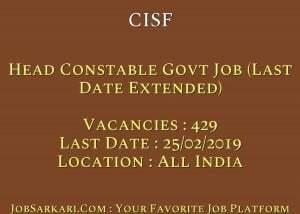 Last Date for CISF Head Constable Govt Job (Last Date Extended) Posts is 25/02/2019. Q. What is the Form Type of CISF Head Constable Govt Job (Last Date Extended) Recruitment ? A. The Form Type for CISF Head Constable Govt Job (Last Date Extended) Posts is Online. Q. 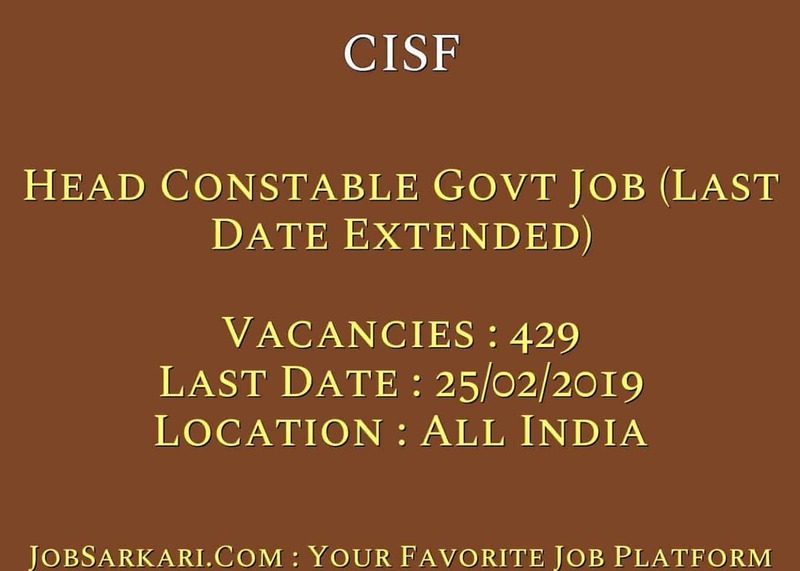 How many vacancies are available in Central Industrial Security Force Head Constable Govt Job (Last Date Extended) Posts ? A. There are about 429 Vacancies in Central Industrial Security Force Head Constable Govt Job (Last Date Extended) Posts. Q. What is the Full Form of CISF ? A. Full Form of CISF is Central Industrial Security Force . Jab Admit card aajaega Aapko inform kr Diya Jaega..
Aap iski Official Site pe Check kr sakte hai..
Hello, You Can Check Syllabus in Notification. Thank You. Han Aap Mobile Se Form Bhar Sakte Hain…. What is the Form Type of CISF Head Constable Govt Job Recruitment ? A. The Form Type for CISF Head Constable Govt Job Posts is Online. 165 Cms For Gen and 162.5 For ST Candidates. Ab Date of Birth Thik Nhi Ho Sakti..